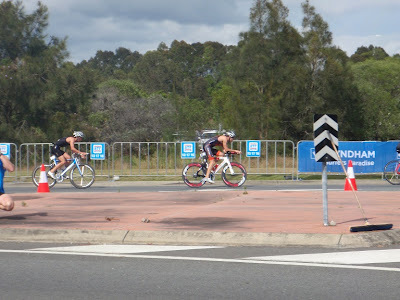 The Triathalife: Gatorade Series Race 2 - "Rumble in Robina"
A glorious day awakened for the start of the Gatorade Series Race 2 - “Rumble in Robina”. The two days leading into the race for me were a mixed bag. 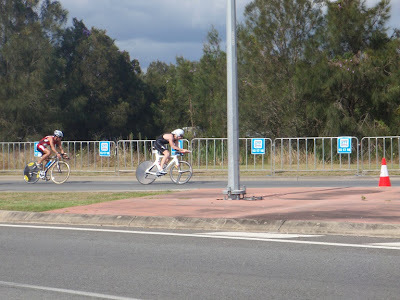 On Friday, I managed a solid ride / run session in the morning and had a great massage in the evening at Moorooka Therapeutic Massage (thanks Jodie). But on Saturday, I woke up feeling tired and run-down like an old pair of undies that are ready for the discard bin. I decided to cut out my planned swim session and instead did a very brief ride on my bike (more to check the setup once I had put the race wheels on and the recharged Di2 battery). I also made myself have a good stretch to try and get rid of some muscle fatigue, and played some Canasta with my mum and Aunty who was over from WA. The ‘relaxed body and mind’ must have worked, because on Sunday morning I woke up with more of a spring in my step than I have had in weeks. No excuses here – I was ready to race. Up at 4:10am and in the car by 4:30am. Fun, right? Not really excited by getting up this early, I do everything I can the night before to make it quicker (so I can sneak that extra 10 minutes sleep!). I pack my bag the night before a race to avoid extra stress in the morning. I also put my drink bottle on the bench in the kitchen so minimal thought is required when I wake up. This is important as the cogs take a little bit to get going at 4:10am. As much as I’d love to have some caffeine, I hold off as I don’t want the peak and fall before the race. My pre-race meal is usually the same, although with these shorter events I tend not to stress too much about getting all the carbs in. Again, I plan ahead to take the stress out. So today, I knew that I’d have an Up&Go in the car around 5:30am which would make it about 2hrs before the starter’s gun. I aim to get my main pre-race ‘meal’ in at least 2hrs before jumping in the water so my body has time to digest it. Having missed Race 1 this was my opportunity to see where I am at compared to the other guys in my category. 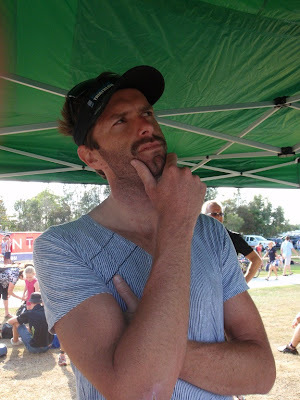 I checked the results after Race 1, and had a chance to race a lot of the guys who did well at Raby Bay, at Noosa 2 weeks ago. 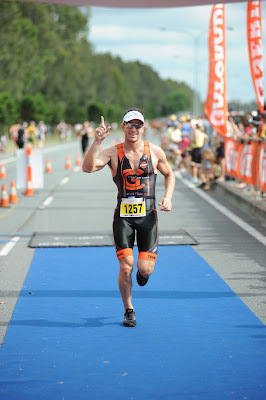 BD won Race 1, and beat me at Noosa by 1:17. Matty Breakspear had also topped me at Noosa by 27 seconds. This is something that I am really coming to enjoy in these races; having been around for a while I am starting to know the faces of the guys and can have a laugh with them on and off the course. Don’t be fooled though – the competitive nature is there alive and thriving in all of them! In an event that is over in under 50 minutes, every second counts, which makes it even more competitive. Love it. Once I had persevered through the longest toilet line in history (it took 3 photos to capture it all! ), I headed ‘out the back’ of the swim start to get my swim warm-up in. 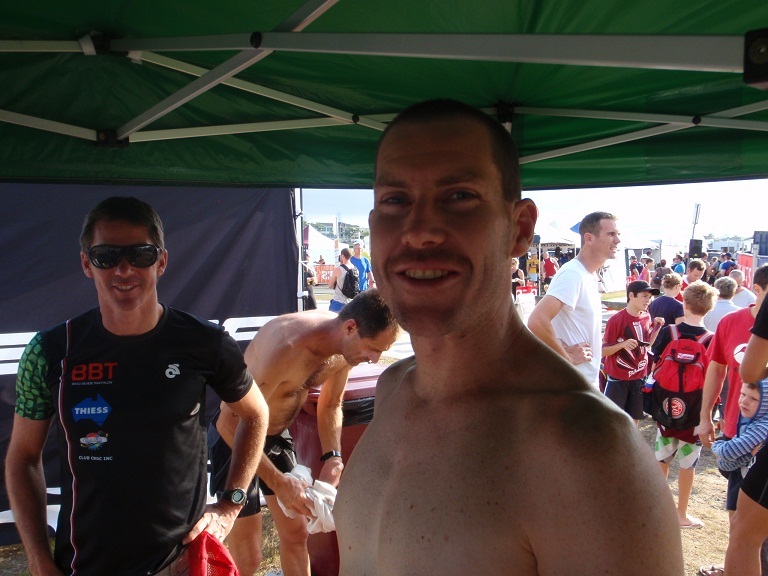 The water temp was great, though I can only imagine how warm it is going to be next time we are at Robina racing. A few hard efforts later and I was back on dry land with the crew, ready to rock n’ roll. A look around at the start and everyone had massive smiles on their faces. This is what it’s all about! I headed down the ramp and into the water for our start. I placed myself towards the front, in behind BD as I knew he would hold a quicker swim than me. I was hoping to find his ‘friendly feet’ but once the race started he was off. As I’ve mentioned before, I am in the process of ‘remoulding’ my swim-race brain. 400m today, so I just kept thinking full throttle. I tried to keep the balance of being more aware of what is going on around me, while also being aware of my own form. I found my pace and while it hurt I reminded myself that I had just done 500m efforts in Thursday’s Reddog squad, so 400m will be over in no time. Right? We came up behind the group in front of us, so there were a few bobbing pink-caps scattered along the way. I tried my best to keep a good line while not swimming over anyone; I think I managed to do this alright. Around the last buoy and with the shore and swim exit in sight I focused on keeping my technique (relaxed, long strokes with hand-to-thigh each time) and quick arm turnover. I kept swimming until my stroke touched the bottom, then I stood up. How good does the touch of ground feel at the end of a swim! Up the shore and Jiggles gives me a confidence boost – “good swim mate, BD is just up ahead”. Running into transition I see Matty and we share a few words about catching up to BD. The race is on! I get to my bike and out onto the course as quickly as I can. I'm feeling pretty excited because I have come out of the water in the mix, which is not normally the case. By the time I am on my bike and have my feet in my shoes (which were already on the bike) I have passed a few guys in my category including Matty and the Long Course to Short Course People's Champ, Yo-Yo. 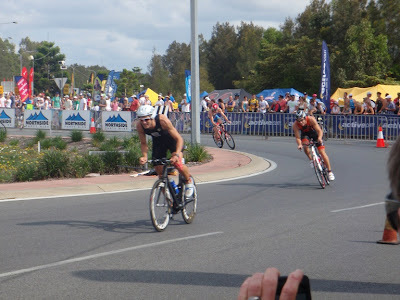 On the bike; this is where I have felt most at home over the past few races. Whatever I am doing in training is working and is giving me the confidence to push hard. 15km is not that long so the intensity is quad-busting from the get-go. I manage to get into the lead of our group in the first lap (though still behind a few super-fish like Josh who smashed everybody - 2nd out of the water was 40 seconds behind him after a 400m swim). 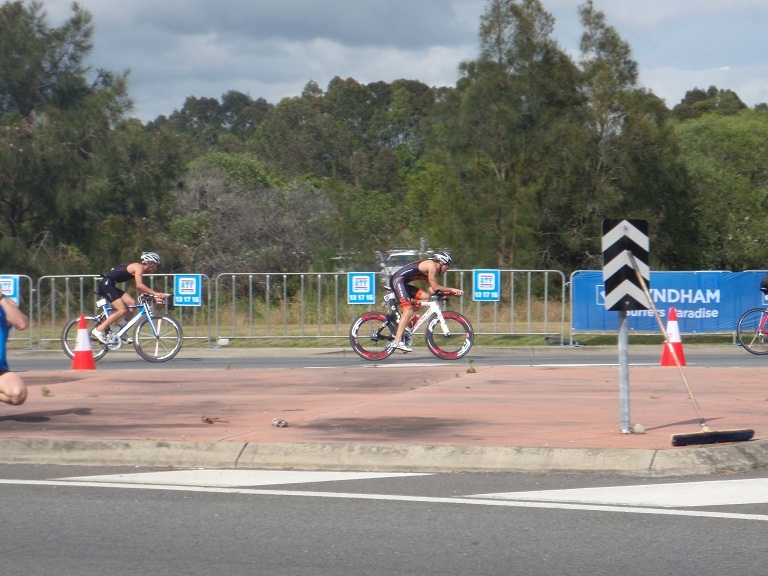 Robina is good because you can get a look at your competitors twice on each lap at the two turnarounds. I could see that the gap was increasing bit-by-bit each time, which made me push harder. Not a bad TT position - I was so far forward on my saddle though that I pushed it down! I knew that I had about 30 seconds heading out onto the run. I managed a quick turnaround, the yankz laces make it easy to get my shoes on in a hurry. While I was happy where I was it is tough mentally being the first onto the run knowing there are 3 or so people hunting you down who can RUN. For the first time in years I was racing without a watch, so rather than being able to check my pace on my Suunto T6D I was running by feel. I tried to settle into a pace that was just bearable. Just. With the run course straight out and back (1k each way) it is easy to set little goals to aim for. It is also easy to see where everyone is at. So the first target was over the little rise and to the first turnaround. No looking back. Just in case. 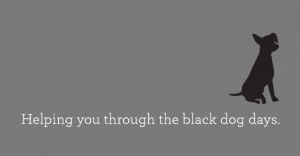 I didn't want to know. At the turnaround and back towards transition I began the count. 1... 2... 3... I got to about 15 before I passed BD and Ricardo. Another 5 before Matty. That makes 30 seconds still. I've just gotta hold on for that bit more. 3k's in training is nothing. But here. Ouch! I try telling myself that 3k's is less than 11 minutes. That didn't really hearten me much at this point in time! 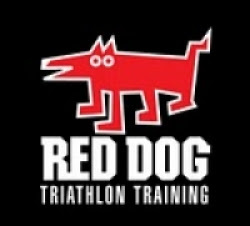 At the 2km turnaround and Ewan from Reddog gives me a few cheers which puts a brief spring in my step. I see the gap is still there (though shortening slightly perhaps). I ease off a little in the 3rd km. I remember at Bribie I was in a similar spot and kept pushing hard, so when Tim caught me and passed me there I had nothing left in the tank. I thought if I race smarter today and try to leave a bit I might stand a better chance to push to the line if they catch me. At the last turnaround I notice the gap is still there so I pick it up again and push for home. I know that I can knock out 1k in under 3:30, so if I can do it just one more time today then to catch me the guys would have to be flying. I end up with the 5th fastest run (all 3 of the guys chasing me had faster splits) and managed to hold on for first place with 27 seconds to spare. A week of taking it easy now to reset my mind and body. While I'm looking forward to a few sleep-ins, the sun is up so early now I find I'm awake by 5:30 anyway! My dog is going to get some extra walks this week, that's for sure. 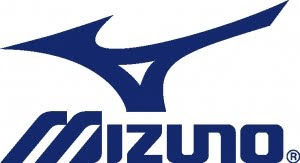 Thanks to the guys from Active Stride, Mizuno and Chain Gang Performance Bikes for their support leading up to the race. 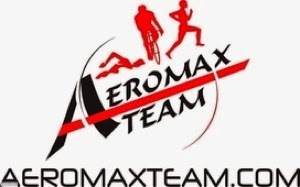 I'm enjoying have the chance to share my race experiences with others who are getting into the sport.